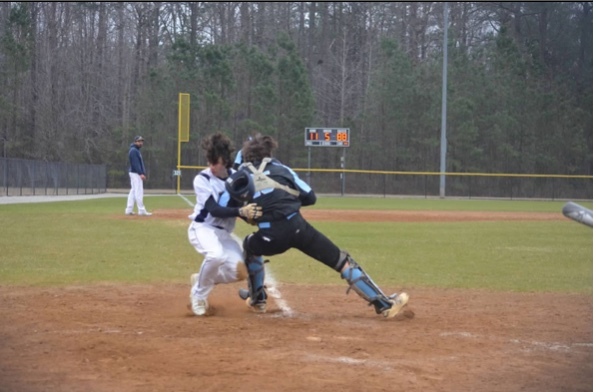 Lafayette high school Junior, Thomas McLaughlin collides with Warhill catcher Junior, Riley Motley at a close play at the plate. Now that the Lhs baseball season is off to a start things are looking good. 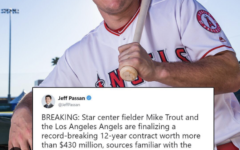 With the season being 3 games in, with a record of 2 wins and 1 loss the team is better than ever. So, here’s the recap, with the season opener being a trip out to Smithfield the team was already out to a disadvantage due to playing a road game. 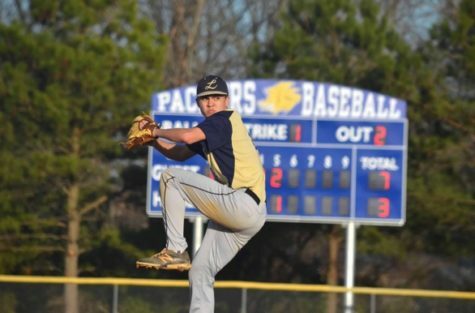 Senior, Geo Rivera started the game off strong pitching 2 innings of no hit baseball. While coming out with a headful of steam, the Rams first batter, freshman, Luke Hanson put together a 9 pitch at bat which at the end of he pulled through with a double down the left field line. The third inning is where the game became interesting, after back to back singles by senior, Ricky Sullivan and junior, Michael labella and a walk by Ssphomore, South Mcdowell the bases were loaded. With only one out Junior, Ryan Labella grounds into a fielder’s choice scoring two runs for the Rams. The next at bat was big, with baserunners on 2nd and 3rd Junior, Drew Ramos hits a bases clearing triple to score 2 more runs that set the pace of the game. After that inning the game was slow, the only runs scored was a 2 run single by Junior, Michael Labella in the 4th and another two run single by sophomore, Jackson Conklin. With a 9-3 win over Smithfield the Rams season was off to a good start. Rams batter Junior, Michael Labella hits a 2 run single to help boost the Rams lead. Game 2 was against Warhill. 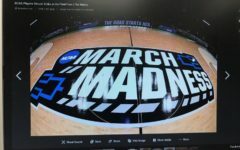 A local rival, the rams knew that they would put up a tough fight. After a slow and raining beginning to the 2nd game, itstarted to pick up in the 5th inning. With a pitching change from the Rams bullpen, the Lions took advantage by scoring 5 runs on 4 hits to put them to a 5-1 lead. Looking defeated the Rams headed back out onto the field for the bottom of the 5th. Lafayette came out swinging, with a single, and back to back doubles they added 2 more runs to the board. With a barrage of singles, doubles, and errors the Rams jumped on the Lions, scoring 12 runs that inning, the Rams were on fire. 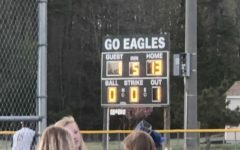 With 2 walks in the 6th inning and an error by the left fielder, the Rams scored 2 runs to mercy rule the Lions 15-5 in one of their most exciting games of the season. Rams pitcher Junior, Drew Ramos pitches in the 6th inning to help Lafayette close out the ballgame. 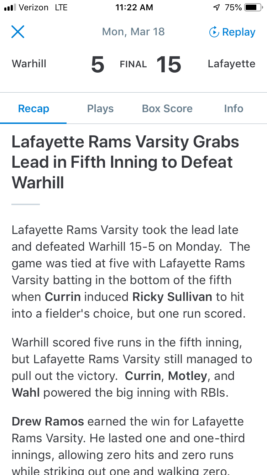 Lafayette Rams recap of game 2 against Warhill high school. Game 3, fresh off their mercy rule victory against one of their biggest rivals the Rams were in for a game. 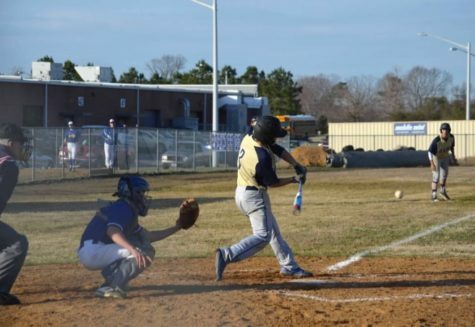 Tuesday’s game against Tabb was heartbreaker as they lost a late lead for a 8-4 defeat. Lafayette had 4 runs on 10 hits. Early in the first inning Tabb started off the game strong with a double and scored 1 run. After that Lafayette had some trouble stopping that strong lead as they put up 3 runs in the first inning against the Rams. After a no scoring 2nd inning due to a double play by the rams the 3rd was sure to be a strong one. In the third inning the rams managed to put up 3 runs to take an early lead on the Tigers. After a long silence of no runs the Tigers managed to put up 1 more run in the 5th inning to tie the rams and bring the ball game back to even. With the tides turning in the 6th inning the Rams were in trouble. The disadvantage of the sun at Tabb made it almost impossible to see any ball hit to left field, and Tabb took advantage of it. After a pair of walks and a single, the Tigers had bases load with 2 outs looking for any runs they could scavenge, and they did. A fly ball hit to left field and an error by the left fielder, Junior, Thomas McLaughlin, the Tigers put 2 more runs on the board. 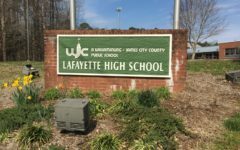 With the next batter up doubling to left field scoring two more runs, Lafayette knew they had been defeated. The Rams managed to put runners on 2nd and 3rd but could not score enough runs in time to complete the comeback. 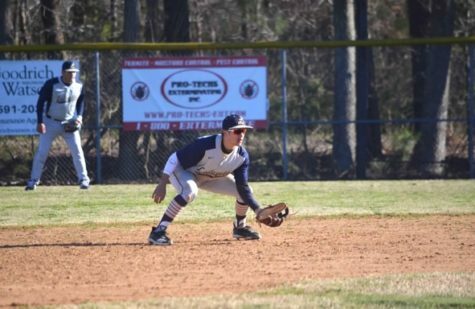 Fielder Senior, Ozzie Torres prepares to field a ground ball against the Tabb Tigers. With a hard loss of game 3 the Rams head into their 4th game vs. Bruton high school with a strong will to win. The Rams are looking for a big win against Bruton to show what they are really made of. After winning the first game and losing the second game against them last year. 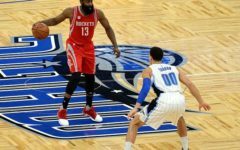 Lafayette has high hopes for this year’s season with lots veterans and rookies joining together.